The small, extremely faint dwarf galaxies that surround our own Milky Way galaxy are notoriously difficult to detect. Simulations predict the existence of thousands of these satellites, but only about thirty have been found, a discrepancy known as the “missing satellites problem.” This suggests that either the Milky Way is anomalous, or there may be a fundamental flaw with our standard model of the growth of galaxies in the universe. In recent years, there have been several interesting observational techniques proposed in order to find these missing satellites, including watching for their effects on tidal tails or on gas within the host galaxy, or searching for the gamma-ray signature from dark matter annihilation inside them. A new method for finding satellites, based on gravitational lensing, has recently succeeded in identifying a dwarf galaxy; and, surprisingly, the galaxy is not located in our own Local Group, but nearly 10 billion light years from Earth, making it by far the most distant dwarf galaxy ever discovered. Even cooler, the dwarf galaxy is dark: its composition is dominated by dark-matter and it contains so few stars that the current generation of optical telescopes cannot directly image it. The new dwarf galaxy found by Vegetti et al. is a satellite of an elliptical galaxy at a redshift of , about 9.8 billion light years from Earth. The massive elliptical, known as JVAS B1938+666, serves as a gravitational lens for a bright galaxy located directly behind it, but much farther away from Earth (about 17.3 billion light years). The massive gravity well of the elliptical galaxy bends the light from the background galaxy as it passes by on its way to Earth, focusing the light like a lens. The bending of the background galaxy’s light deforms its image into an arc around the lens galaxy. In this system, the arcs of the background galaxy form a complete circle, a phenomenon known as an Einstein ring. The Einstein ring can be seen clearly in the figure to the left. The research team led by Vegetti was able to detect the dark satellite by taking extremely sharp images of JVAS B1938+666 using the Keck 10-meter telescope and its adaptive optics system, which corrects blurring caused by the Earth’s atmosphere. While the satellite galaxy is too faint to image directly, it is possible to infer its presence by studying the properties of the Einstein ring. These properties are sensitive to the mass distribution of the foreground lensing galaxy, much as the shape of a glass lens changes the image it produces. 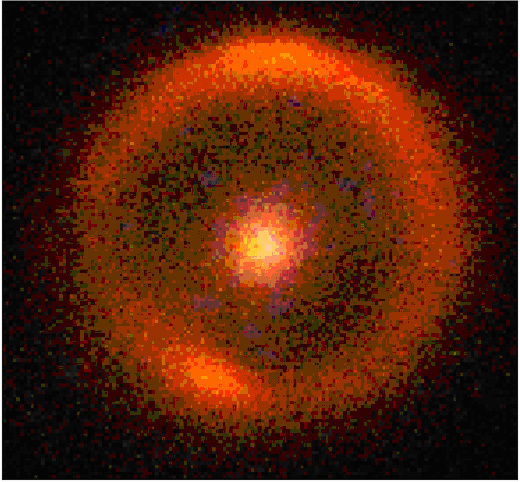 The authors analyzed images taken with Keck at both 1.6 and 2.2 microns and found an anomaly in the brightness of the Einstein ring that required the existence of a large amount of mass – a dwarf galaxy – around the main lens galaxy. Because the dwarf galaxy did not show up in the images, the authors were able to place an upper limit on its luminosity; the satellite could not have a luminosity greater than about 50 million times the luminosity of the Sun. The authors then employed an analytical model to measure the mass of the dwarf galaxy and the statistical significance of their detection. They found that the model that included the dwarf galaxy was favored by a factor of (that’s about !) over a smooth model with no satellite galaxy. The most probable model favored the satellite galaxy having a mass of , where is the mass of the Sun. Combined with the upper limit on the satellite’s luminosity, the authors find that this dark satellite has observational properties similar to the Sagittarius dwarf galaxy of the Milky Way. Recently, this gravitational lensing method was also used to detect another dark satellite galaxy (reported here). Vegetti et al. use a statistical analysis to consider whether the presence of these two new dark satellites conflicts with the standard cosmological model. This model describes a universe composed of ~23% dark matter where galaxies form from the merging of many smaller galaxies. The authors find that the current results are consistent with the standard model at the 95 per cent confidence level. Similarly, the results are also consistent with current simulations of our own Milky Way, which means that there may indeed be thousands of dark satellites around our own galaxy waiting to be found. However, more dark satellites will need to be discovered in order to verify these conclusions. Luckily, this new gravitational lensing technique provides an exciting method of doing just that. Dear Author, in JVAS B1938+666, JVAS is Jodrell Bank-VLA Astrometric Survey but what does “B” stands for?